I would like to introduce Bheki to you. 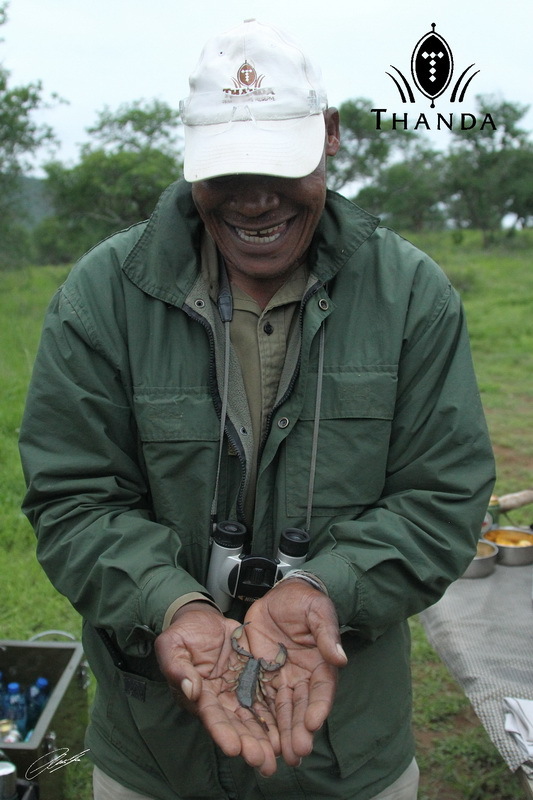 Without him I could hardly do my job at Thanda. He is my “Communication and Navigation Officer”. Bheki is an excellent tracker. He is constantly on the outlook for tracks and signs of animals in the bush and he communicates with the other trackers over the radio. The picture above shows him in his “front office” of our Land Rover. Bheki is a tracker for over 20 years. 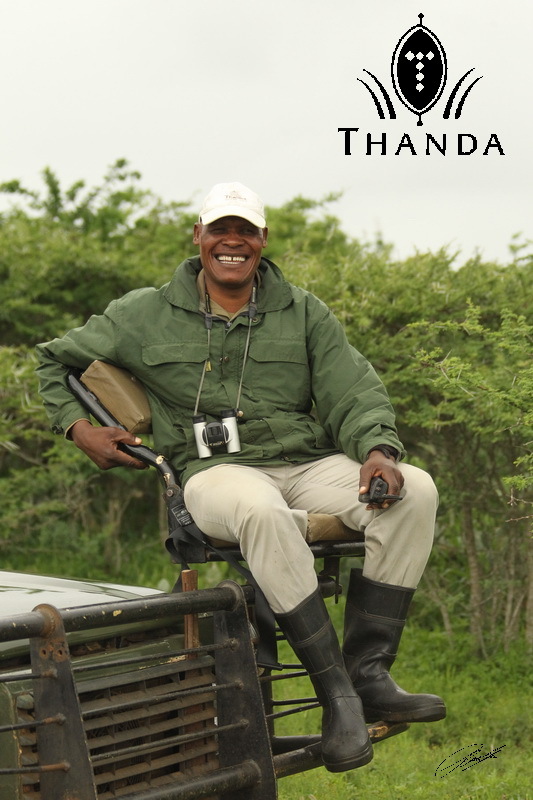 He knows the bush very well and he enhances our game drives with many stories for the guests. 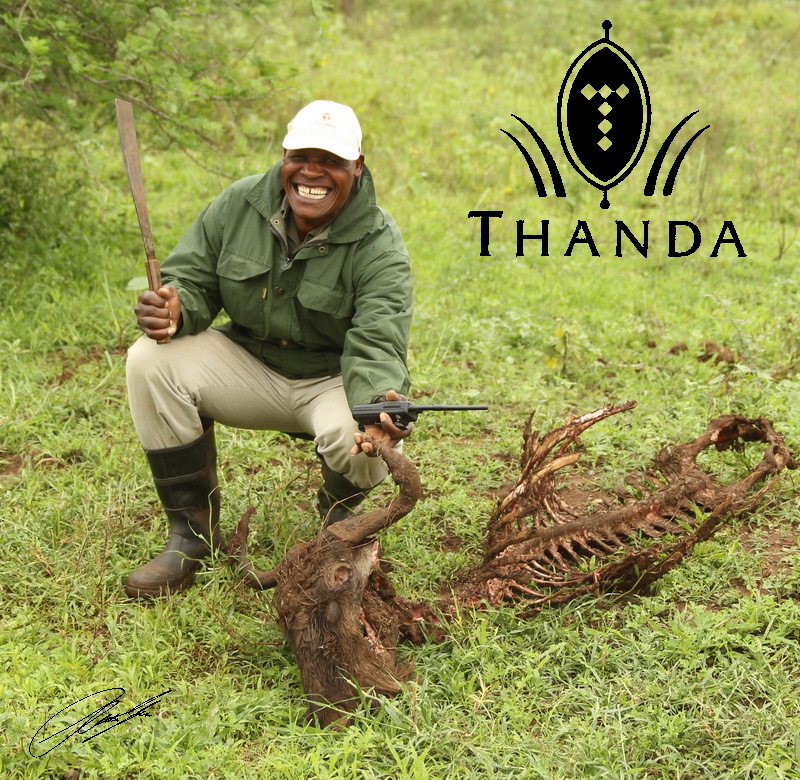 In the second picture he shows a Wildebeest carcass, which had been killed and eaten by lions. Walking in the bush (with the big five around him) is no problem for Bheki. With only his panga (the African version of a machete) as protection he often walks off by himself looking for tracks. 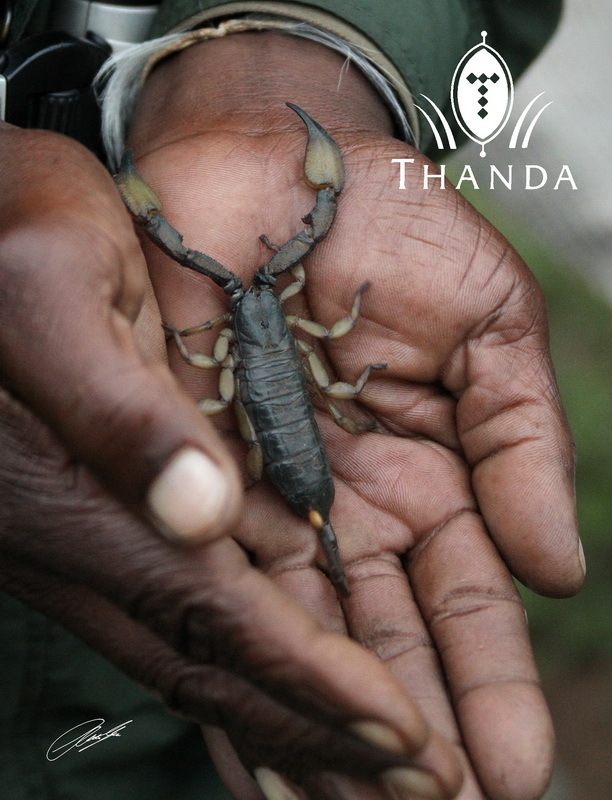 In the third picture Bheki shows a (harmless) Scorpion to our guests during a drink stop at sundown. Bheki is a man living in the Zulu tradition. He has a beautiful piece of land in a local Zulu community on Lake St.Lucia where he lives with his family. He has two wives and nine children. His father before him had nine wives and Bheki has 64 brothers and sisters. Remember that elephant blocking the road on our drive out to the Cheetah Rehab Center? She refused to move just starring at us and was so sassy about it when she finally decided to let us pass! What an experience 🙂 You are by far the best tracker we’ve had in all of our drives! You captured the all-classic Bheki smile! He really does smile so heartily like that all the time, doesn’t he? So great! Thanks also for sharing your camera tips – our photos came out really well! Bheki looks to have natural happy smile!! I’m sure that he’s alot of fun and company on your drives and can offer alot of insight in the bush. I’m sure your learning alot from him. Be safe, and as always Have A Great One!! What a fantastic smile Bheki has! I work with a physician whose first name is Bheki too. What an interesting person your Bheki is! Loved hearing about what he does for a living and how he bravely walks around the bush with just a machete. Seems quite dangerous to me! Most interesting about his family too! What a different world you live in. Love your stories and pictures. Bheki’s front office is, no doubt, one of the best in this world. Thanks for introducing Bheki. You can tell from his smile he is very happy. The stories I heard from my guide in Tanzania were great, so I imagine his are also. Sounds like a great team.